Here at CupidsPulse.com, we saw firsthand the true devastation caused by Hurricane Sandy. Our offices were located in the center of the storm, and we feel very fortunate that only a portion of our office was impacted. We were out of power for 13 days, but that is nothing compared to what so many other people faced – and are still facing. Many New Yorkers continue to experience distress: they have no place to live, there personal belongings are gone and they have no place to celebrate the holidays. 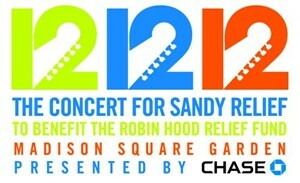 In hopes of helping these people rebuild their lives and their homes, a very special event takes place tonight: “12-12-12,” the biggest concert ever staged at Madison Square Garden, will begin at 7:30 p.m. EST and focus on the impact of Hurricane Sandy. The concert includes performers such as Bon Jovi, Eric Clapton, Alicia Keys, Kanye West, Billy Joel and The Rolling Stones. Additionally, stars including Leonardo DiCaprio, Jake Gyllenhaal, Adam Sandler, Kristen Stewart, Jessica Chastain and more will participate in the show to help the victims of the Superstorm. If you can’t be there in person, “12-12-12” will be distributed to nearly two billion people through television feeds, radio and online streaming. Given that the holiday season is all about love, be sure to tune in and show your support to the many New Yorkers still suffering. For where to watch or listen, click here.